Shoreacres is characterized by massive private lots, and quiet mature tree-lined streets. Many of the homes are sprawling ranch style bungalows built in the 1950’s and 1960’s. But, you will also see plenty of 2-storey custom build homes to accommodate larger families. The top elementary school in Burlington. St. Raphael ranks #1 on the Fraser Institute list of best schools, according to EQAO results. This 3-storey, 11,000 square foot mansion is located on a 14 acre waterfront parkland. The space is available to rent for your wedding or any other occasion, but you can also walk the exquisite grounds and take family photos anytime. Sprawling ranch bungalows (the kind with closet space) on huge lots, surrounded by beautiful tree-lined streets. Did you know that a co-op daycare/preschool is organized and administered by the parents? This means less of a cost to parents, while feeling involved in the community. Muppets is a favourite of Shoreacres residents and anyone else in Burlington who hears of it! Ooh and ahh at all the amazing properties here. These are “next level”. How much does it cost to live in Shoreacres? Driving to Toronto from Shoreacres takes approximately 40 minutes. However, during rush hour the time you spend in the car could increase to approximately 1 hour 15 minutes. Using the Appleby GO Station is a huge benefit to local residents and gives commuters a consistent travel time to Union Station of 44 minutes. Shoreacres is also situated close to the QEW. Should you consider buying a home in Shoreacres? This neighbourhood is very walkable. Seriously, people drive to Shoreacres just to go for walks. Specifically, they go to Paletta Mansion and waterfront park and stroll the grounds whilst snapping selfies (feel free to photobomb them with disapproving faces). You’ll also find people at this beautiful site who have hired photographers to capture idyllic family moments between their toddlers’ screams for snacks. It’s easy to see why Shoreacres is one of Burlington’s most expensive neighbourhoods. Outside the park you will find Shoreacres is characterized by massive private lots, and quiet mature tree-lined streets. Many of the homes are sprawling ranch style bungalows built in the 1950’s and 1960’s. But, you will also see plenty of 2-storey custom build homes to accommodate larger families. With excellent schools in the area too, buyers scour Shoreacres to find “tear down” options upon which they can build their dream home. 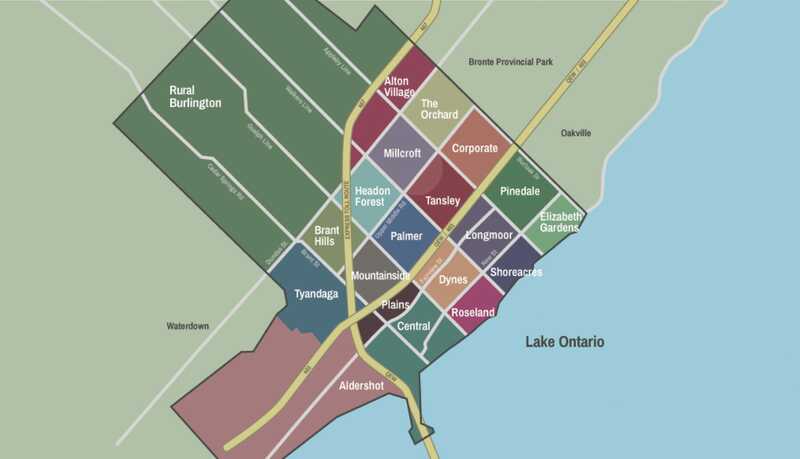 Given its appealing housing options, lot sizes, natural beauty and location bordering Lake Ontario, it’s easy to see why Shoreacres is also one of Burlington’s most expensive neighbourhoods.